Almost every frequent online shopper in Japan knows about Mercari! In short, it is a user-friendly, hassle-free shopping and selling APP! Its flea-market style provides everyone a safe and easy platform. Mercari sells all: from empty toilet paper rolls to second-hand cars, just name it and you will find it! People might wonder: what do I do with an empty toilet paper roll? In fact, it is widely used in art classes in Japanese kindergartens! 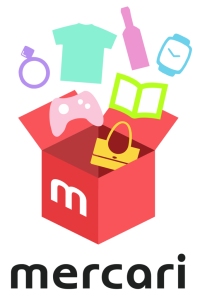 So mommies, you will be very happy to find what you need in Mercari! Household goods that you find redundant and useless could be popular in Mercari. 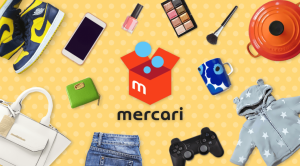 Mercari knows what the customers want, and that is why it is very popular in the world! How can you become a Mercari user? Just slide your cell phone screen for a couple minutes and you will become a Mercari shopper or seller in no time! You decide the prices, YOU be the BOSS! 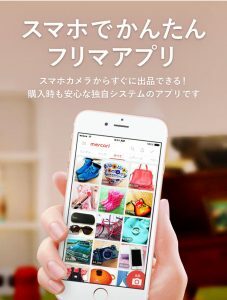 Mercari App, since launching 2013, has had over 40 million downloads; daily listings are over half a million, monthly transactions over 10 billion Japanese Yens! You might be interested to know, half of the listed items in Mercari are sold within 24 hrs of listing! No wonder Mercari is most popular among Japanese college students and housewives, its efficiency and profits win over other online selling platforms such as Yahoo. These people uses Mercari to sell their old items and then cash in for name brands goodies, environmental-friendly and always have new items to wear! The success of Mercari lies in its safe environment for all transactions. Mercari will hold payment until buyers receive their items, notify Mercari upon reception, then will sellers receive the money. ● Although there are many second-hand items sold in Mercari, you can find more new goodies! So no hesitate to buy new stuff for yourself and family! The reason: sometimes it is riskier to buy second-hand clothes, because you do not have the chance to feel the texture or to try them on. So always pick new shoes and clothes at Mercari, quality guaranteed! ● Best timing to purchase apparels is around New Year, when all kinds of fukubukuro(Lucky Bags) are for sale! This is when sellers want to list out all the off-season outfits and clothing, so grab your chance and get great bargains! ● When you want to buy something, you can check first with Mercari listings, then compare prices on Yahoo Bid. There is no bidding mechanism for Mercari. If you think the price is good, the deal is done! For detail, please visit Proxy Guide of Mercari Japan.